Gabor Fichtinger received the Ph.D. degree in computer science from the Technical University of Budapest, Budapest, Hungary, in 1990. He is currently a Professor in the School of Computing, with cross appointments in the departments of Mechanical and Material Engineering, Electrical and Computer Engineering, and Surgery, Queen’s University, Kingston, ON, Canada, where he also directs the Percutaneous Surgery Laboratory. He is also adjunct professor in Radiology and Computer Science at the Johns Hopkins University, Baltimore, USA. His research specializes on medical image computing and computer assisted interventions, primarily for the diagnosis and therapy of cancer. Dr. Fichtinger is a Senior Member of IEEE, Distinguished Lecturer of IEEE EMBS, and a Fellow of MICCAI. 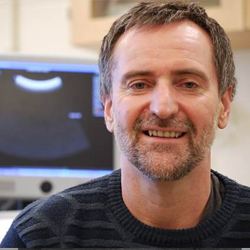 Dr. Fichtinger also holds a Level-1 Cancer Care Ontario Research Chair in Cancer Imaging.